So What Are We All Reading Then? I have had another bonkers week followed by a lovely weekend away with my mother. The former has meant I haven’t done much reading, the latter has meant I have done loads as a) the weekend away was five hours by train away on the other side of the UK b) I had a hotel suite to myself which always means more reading. So I thought I would share what I am reading right now, in the hope that you might tell me all about what you are reading, have read and want to read too. So my current read is Sunjeev Sahota’s The Year of the Runaways. Remember I mentioned authors whose debuts are so good you are nervous of the follow up? This falls into that category as I thought Sunjeev’s debut Ours Are The Streets was pretty brilliant when I read it back in 2011, when I was somewhat more succinct in my book thoughts. So far The Year of the Runaways is proving to be just as brilliant, if not even more so. 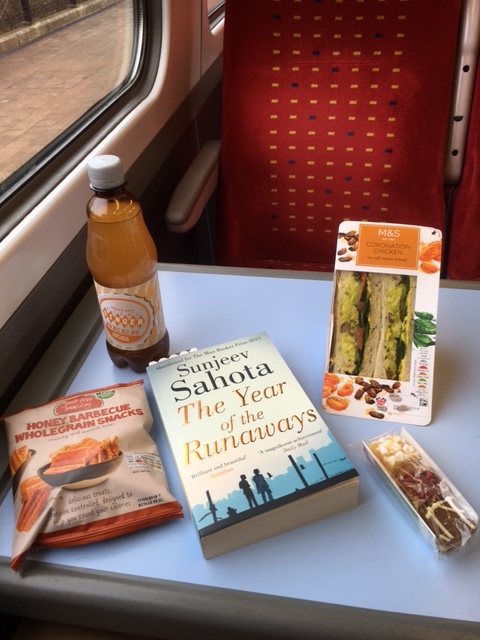 I should say here that this picture is actually slightly misleading, though does show you my second favourite train pastime – eating M&S picnics, as I am not only reading one book but two. I am also slowly (because it is so good) reading Christos Tsiolkas’ Merciless Gods one story at a time so as I can savour it for as long as possible. That said Deborah Levy’s Hot Milk is begging me to read it at the moment, well next. I can also tell you what a few other people are reading. The Beard has devoured The Trouble With Goats and Sheep (which his mum is now reading) before he comes to see Joanna Cannon and I in conversation at Liverpool Waterstones tomorrow at 6.30pm, he is just about to start Love Nina by Nina Stibbe, now with Savidge Reads fiancé status he has to get his reading habits up frankly. My mother was almost finished reading A Little Folly by Jude Morgan, apparently I started her onto Jude’s books, it seems I need to read them. She is going to read (a signed copy of) Carys Davies’ The Redemption of Galen Pike which I gave her this weekend, I would buy that book for everyone in the world ever if I could. So what about all of you? What have you been reading, what are you reading and what do you possibly fancy reading next? A big thank you for all the lovely comments yesterday and all your thoughts, it was really lovely to know that you were all out there giving me your support and condolances. I won’t be replying individually as I don’t really want to dwell on it and so today I thought ‘what would be a joyful post after yesterday’ and so I thought I would share with you what has been arriving through the post box over the last few weeks from publishers at Savidge Reads HQ. 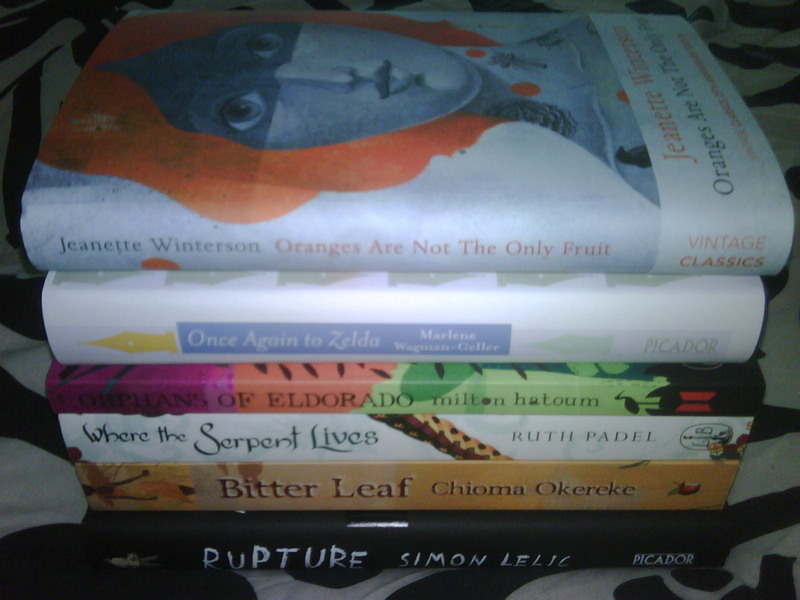 Who out there can say they can’t be cheered up by lots of books arriving? Plus what could be more appropriate on World Book Day? Someone at OUP obviously read my first post of my ‘do I want to read’ series as sure enough it arrived along with two more gothic friends you can see below. 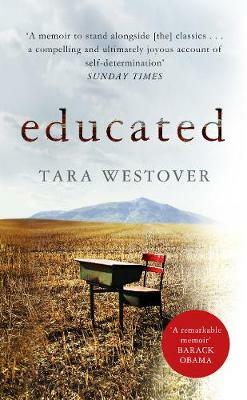 Obviously this is one of the TV Book Group choices and I wouldn’t have heard of this without it am sure. I am looking forward to it just from the title alone. Might try and fit this in before it’s discussed on the telly. This looks like it could be a very me book as it centres on a ‘dilapidated farmhouse’ and dark discovery. I like the mystery of it and the covers quite dark and yet inviting. An author I have had on my radar for quite some time and not dared to try as Udolpho is so huge (see below) this looks much more manageable and just as gothic. Canongate must think me and Ammaniti are going to get on like a house on fire as they sent this with ‘I’m Not Scared’. Reading the blurb he sounds like an Italian Mankell would that be correct? I have seen the posters for this everywhere and so my Savidge Reads Radar has been beeping regularly alerting me that there could be a wonderful book out there I don’t own… which now I do, hoorah! Some say this is the greatest novel every written. I am hoping I have as much fun with this as I did with East Lynne the mother of all sensation novels, we will see. Winterson has been an author I have wanted to try for ages. I had this one already but the new 25th Anniversary edition is just gorgeous and so I will be delving into that very soon. A book I was alerted to thanks to the BBC’s Open Book. This is fifty stories behind fifty dedications in some of the world’s greatest books. With tales of why Jane Austen, Virginia Woolf, Agatha Christie, Oscar Wilde, Grace Metalious, J.K. Rowling and many more, dedicated their books to the people they did. The latest Canongate Myths book which is set in Brazil a country I want to read lots more about this year. Any book that has the settings of London, Devon and the jungles of India needs to be read frankly. I have read some cracking African fiction in the last few months and want to read more so Virago must be psychic as this debut is ‘set in a world that is African but never geographically placed’ sounds intriguing. I have a hunch this might get an Orange mention… maybe. The blogosphere has been going crazy over this book of a teacher opening fire in a school assembly, in the last month or so. Will I be joining them in raving about it? Another author I have always wanted to read and this book of two brothers who holed themselves up (like a male version of Grey Gardens in a way) from the world and lived alone in a dilapidated grand old building of New York. I have an inkling this will become a favourite of the year. I utterly fell in love with Colin’s book ‘The Luminous Life of Lilly Aphrodite’ last year am hoping this book captures the same spell on me. Another author I loved last year as I read ‘The Taste of Sorrow’ and was mortified it wasn’t in the Man Booker Longlist as it was superb. Instead of the lives of the Bronte sisters or any other famous authors we are now treated to a scandalous tale of Regency London. I cannot wait! A slightly leftfield rogue sending from Canongate. This has been made into a ten part series by Tom Hanks and Stephen Spielberg I gather. It looks a bit hard hitting as it’s about the real men involved in the war. I am intrigued but wary all at once. So have you read any of those titles or anything else by any of the authors? Are any on your TBR or radar? 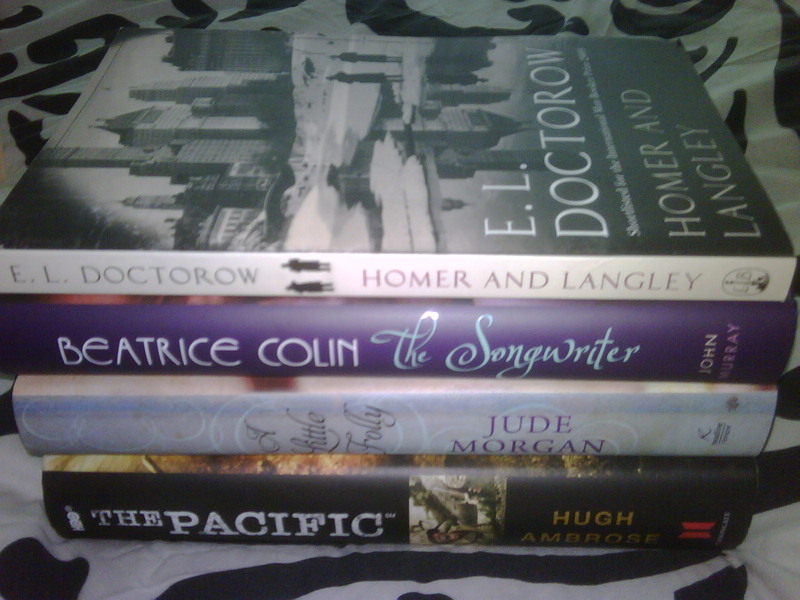 What have you had arrive lately by post, by shopping or by library loaning? 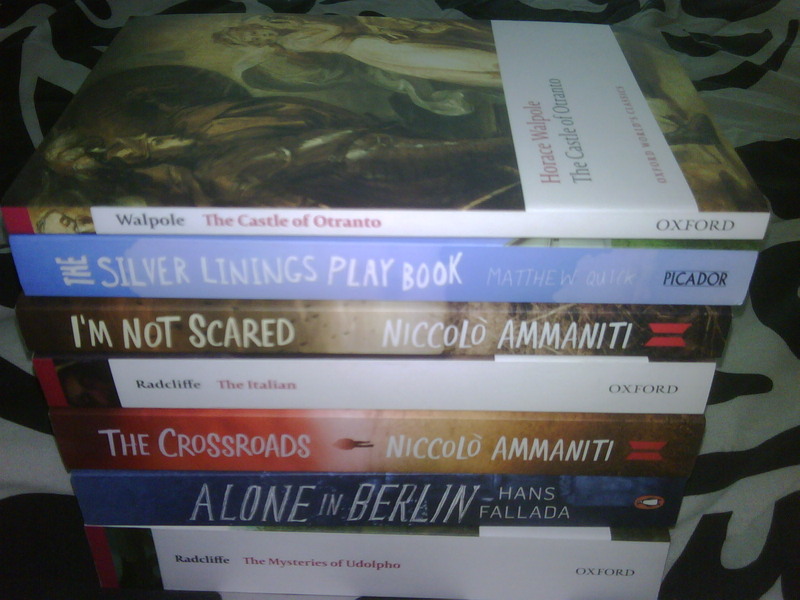 I have been making a concerted effort to read more classics and two publishers you cant go wrong with are Vintage Classics and Oxford University Press. When a rather large thud resounded through the building from the letterbox I came down and found ‘The Bronte Collection’ which includes Wuthering Heights, The Tenant of Wildfell Hall, Villette and Jane Eyre. I will admit I didnt love Wuthering Heights but after reading The Taste of Sorrow by Jude Morgan which is all about the sisters earlier this year I think a Bronte-Binge is on the way and the season after New Year seems perfect for this don’t you think? Might be a good Xmas pressie for relatives this Christmas maybe. (Hang on did I just mention the C word before December starts – I should be ashammed!) They also sent The Wapshot Chronicle by John Cheever and a huge collection of his letters. I havent read any Cheever but am thrilled about these two delights. 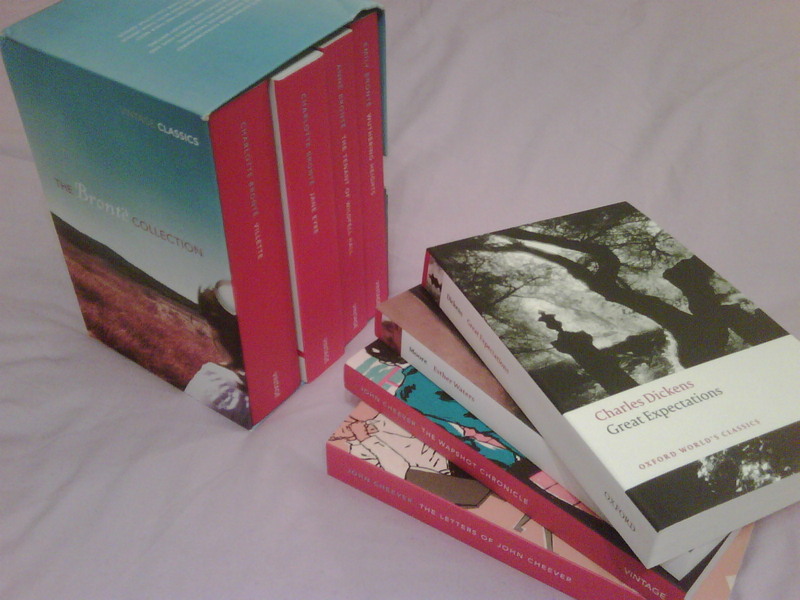 Oxford University Press kindly sent the last of the Sensation Season novels (don’t cry they may be back again next year) in the form of Charles Dickens ‘Great Expectations’ along with George Moore’s ‘Esther Waters’ which hit my attention waves on BBC Radio 4’s Open Book show when they looked at neglected classics. Be warned – the neglected classics are dangerous list of books which could lead to a huge spree. From the people at Harper arrived a very diverse collection of books in one big parcel, the postman is not a fan of this address – his arms certainly aren’t, quite an eclectic mix indeed. Two of the books are from thier new imprint Blue Door ‘The Ballad of Trench Mouth Taggart’ (great title) by M Glenn Taylor and Mots d’Heures: Gousses, Rames by Luis d’Antin Van Rooten the latter can only be described by a post on their new blog. Sounds bizarre but will give it a go. 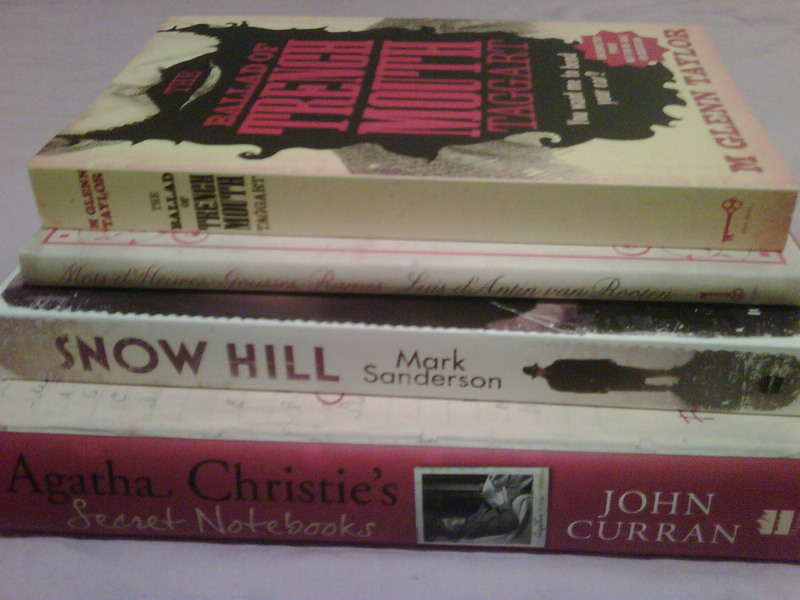 They also sent me Snow Hill a thriller by Mark Sanderson, who has written a memoir so heartbreaking I have owned it for years and never able to read, Mark will be doing a Savidge Reads Grills very soon. Last but not least by any means as actually this is one of the books I have been most excited about in weeks (as you know I am having an Agatha Christie binge) is ‘Agatha Christie’s Secret Notebooks’ compiled by John Curran, I had to stop myself reading it as soon as it arrived. It’s a treat for a very lazy Sunday. Now in a few weeks I will be doing a piece on the books to look forward to over the next year, you can see the predictions I made for this year here should you wish. Already some are coming through the letter box and Sceptre have done some very clever marketing with a collection of three books and three characters “you simply must meet in 2010”. They are called Nevis Gow, Lindiwe Bishop and Jack Rosenblum and I shall tell you more about them in the forthcoming weeks. I just love how they have packaged it all, no titles or authors on the cover, intriguing. Books already out arrived too and they are The Sorrows of an American by Siri Hustvedt, which I think has a stunning cover, and Incendiary by Chris Cleave and you all know how I loved The Other Hand. It’s always nice when a publisher emails you be they big or small. I have to admit I hadn’t heard too much about Honno Press when they emailed me asking if they could send me a catalogue. 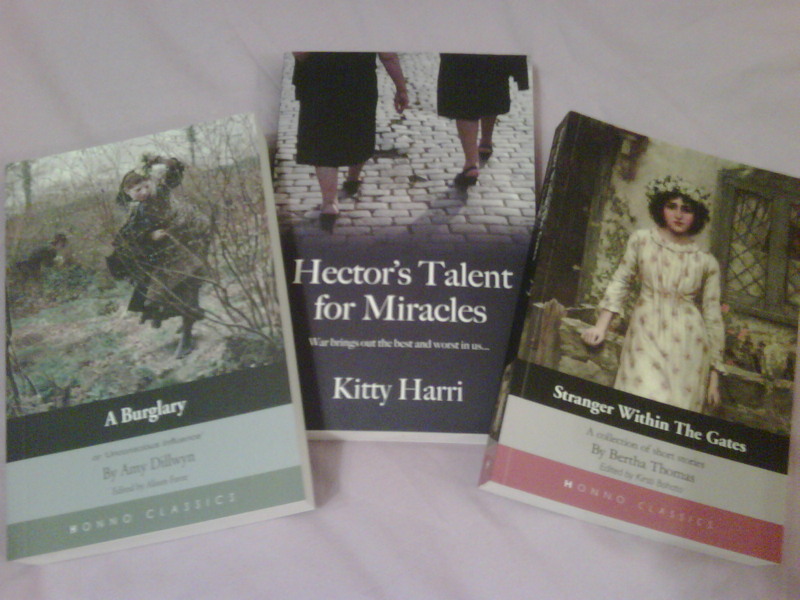 Honno Press is an independent publisher of Welsh Women’s fiction (so a bit like a welsh version of Persephone if you are a fan) and they have a wonderful selection of books, they also go the extra mile as they went through my blog and picked three books they thought I would love. A welsh sensation novel ‘A Burglary’ by Amy Dillwyn, a book where “each generation looks back into the tragic past, loves, secrets and lies are hauled into the open with surprising consequences for all” in ‘Hector’s Talent for Miracles’ by Kitty Harri and finally a collection of witty, wry and sharply observed stories about women with ‘Stranger Within The Gates’ by Bertha Thomas. Sounds like they have got me spot on!!! Blimey. Now over to you… are Bronte’s and other classics the perfect pressies for Christmas and reading as Spring… erm… springs up? 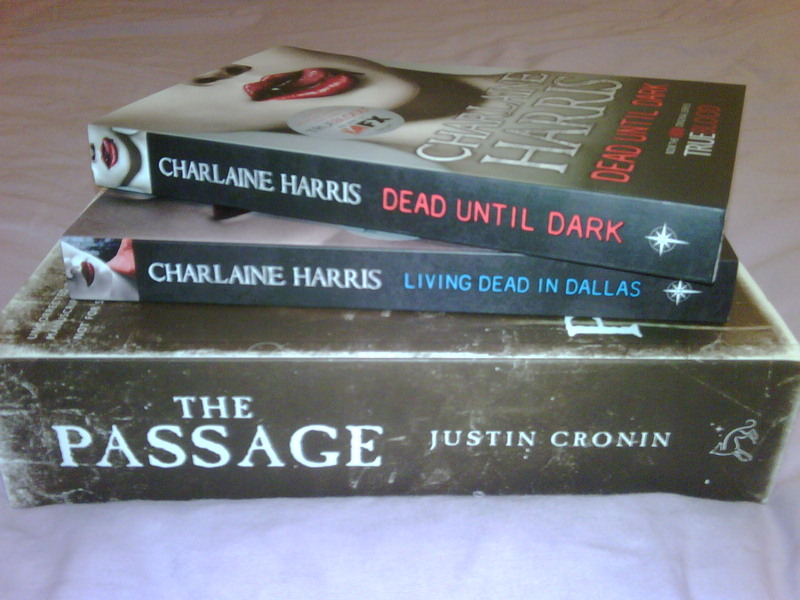 Who has read the Charlaine Harris books, are they like Twilight? 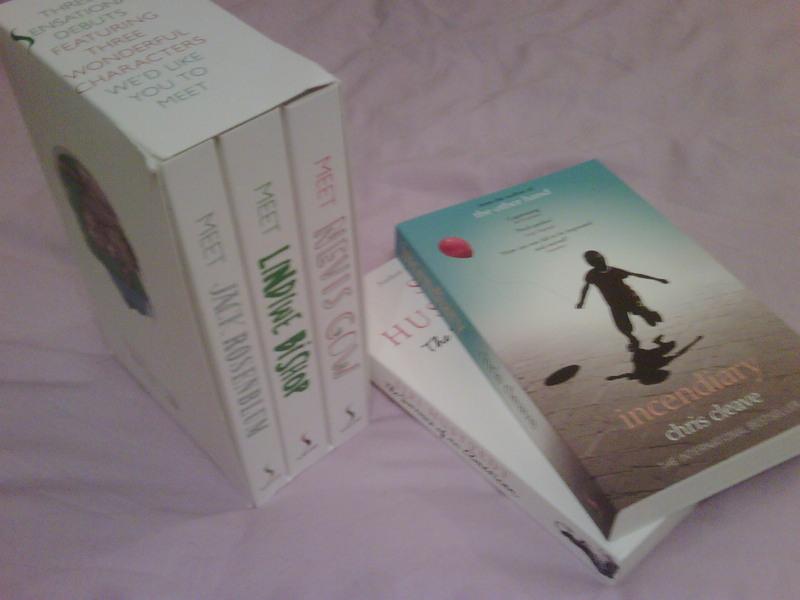 Who has tried Honno Press and what did you think? What will you be curling up with this weekend? What books have you accumulated of late? Informative Reads… Fiction or Non Fiction? Today’s Booking Through Thursday question asks ‘what is the most informative book you have read recently’ and my initial reaction was that all books you read inform you in some way. It could be on the authors thoughts on people/life/certain subjects, it could be the level of research they have put into it or it could be based on factual things that have happened. If I go on the fact that fiction can be informative reading then without a doubt Wolf Hall by Hilary Mantel would be the most informative read that I have had the pleasure of reading in a long time. The lengths that Mantel has clearly gone into researching Cromwell and the Tudor era (and in a way looking extra hard for new information and a different viewpoint to the era as many people have written Tudor based books in the last few years) was immense and you felt you walked the street, breathed the musty air and were actually there. Some people may say that fiction isn’t fact and I am aware fo the difference but when its based on fact, researched and thoroughly written I still think, with the right mindset, we can learn from it. I could also apply this to The Children’s Book by A.S. Byatt, Daphne by Justine Picardie or the Taste of Sorrow by Jude Morgan I just haven’t read those as recently. When it comes to non fiction, which I suppose is really the most informative books that you can read, then it’s a bit harder for me because I don’t read very much of it. My instant thought was The Letters Between Six Sisters all about The Mitford’s but that I read almost a year ago. Then looking back how could I have not thought instantly of In Cold Blood by Truman Capote which is one of the best books that I have read in 2009. Based on the savage murder of a family in rural America Capote writes the factual events (in such a stunning way you almost cant believe its not fiction) and looks at why people kill people, what makes people murder and how does it effect the surrounding village and population and their lives and how does it effect the families of the victims and the murderers themselves. It’s an incredibly insightful, moving and very informative and shocking book. So what’s your most recent informative book? Do you agree or disagree that some fiction, or all fiction, can be informative in its own way? Have any fictional novels based on fact blown you away and made you feet like you were actually there? What fiction have you learnt from? What non fiction must I read? I wrote a while back about how this had pleasantly landed upon my doorstep from the lovely people at Headline and though only having read one Bronte novel (which I didn’t really like very much – Wuthering Heights) I loved the premise of a book all about one of the most famous families in English Literature, if not the most famous. Having stayed in Haworth, drunk at The Black Bull and most importantly getting to walk round the parsonage I can totally understand people’s fascinations with the Bronte’s. Reading ‘Daphne’ earlier this year and seeing that Daphne Du Maurier was also intrigued only made me intrigued further, though I have still as yet never read another Bronte book. That, thanks in the main to Jude Morgan, is definitely something that I am going to rectify. ‘The Taste of Sorrow’ starts in some ways as it means to go on, this is no fairy story. Those of you who have read up on the sisters or been to the parsonage will know they struggled through life until they finally published there books, which actually happens very close to the end of the book. In fact Morgan concentrates very much on the times before they became household names. The opening chapter and scene is that of the Bronte children’s mother, Maria Branwell on her deathbed and is told mainly from the eyes of their father Patrick Bronte, originally Patrick Prunty, as he watches his wife die not knowing what to do about or for his children. Growing up motherless though they have their mother’s sister in the house Maria, Elizabeth, Charlotte and Emily (Anne being too young and Branwell being a boy) are all sent to Cowan Bridge and The Clergy Daughter’s School to train to become governesses. The family not being rich the girls will need to make money for themselves “a pittance” as securing them husbands is not going to be easy. This part of the book is very dark and leads you through grim corridors, itchy uniforms and the evil watching eye of Miss Andrews who see’s all children as ‘hoydens’ which I think is a wonderful word (one of my cats, sadly no longer with us, was in fact called Hoyden) and its this sort of language that Morgan uses, along with some profanity I didn’t think people would have known back in those days. In many ways its Morgan’s very real language and dialogue, which never sounds modern, always grounded and readable and added to the pleasure of reading the novel. Anyway I digress. From the poor school, as Patrick cannot afford better, great woe comes as the eldest two daughters, who I always forget about, Maria and Elizabeth become ‘consumptive’ and like many of the girls in the school of the time sadly pass away. The girls in actual fact died just over a month apart, something which shocks and partially destroys the Bronte family unit. It also adds to the pressure of all the remaining children that they must become great successes however the fantasy world of ‘Angria’ is much more interesting and they throw themselves into it to escape the real world, only the real world can never quite be escaped. We then follow them as they struggle to leave ‘Angria’ behind in their childhood as they grown up and try to make a success of their lives, which isn’t for a very long time writing as ‘girls don’t write books’ and won’t get published. Some of you will know what happens in that time other’s will not and I refuse to spoil it. I will say it is absolutely wonderfully written. I found it hard to tear myself away from the book and in fact spent a whole day in bed with it (well I did have swine flu too, had it been the weekend I would have made some excuse). Morgan brings to life the three famous sisters and their different character traits. Charlotte who is strong minded, yet fearful, independent yet nervous. Emily is quite cunning and dark and often compared to a cat. Anne the baby of the family who is quite quiet and meek and yet has a lot going on in her head and once you get to know her is much wiser than her years. Branwell and his downfall are of course there but at the heart of it this is very much a book about Emily, Anne and Charlotte… and now I want to run off and read all of their books. Well I have read Emily’s but after reading ‘The Taste of Sorrow’ I might have to give it another whirl as I think it would have more resonance with me now, strange how a fictional account of her has made me want to re-evaluate my thoughts on her work. I think that shows the power of Morgan’s writing, whose back catalogue of works I will be adding to the TBR along with everything Bronte. A truly wonderful book that anyone who loves books, let alone anyone intrigued by the Bronte’s, should read. I am gutted it didn’t make it onto the Man Booker Long List, I think its safe to say it will make it onto my favourite reads list at the end of the year. Have you read any Jude Morgan which one should I read next? Where should I start with the Bronte’s? Will I be even close? I would love to be and possibly feel a little current and with it, at the same time I would like to be quite wrong and see lots of talent I haven’t spotted that I can then read if that makes sense? Out of my list I would most like Kamila Shamsie, Jude Morgan or Samatha Harvey win, though really its a close battle at the moment for Kamila Shamsie and Jude morgan as to who has written my favourite read of 2009 so far! Who do you think will get longlisted? Are you going to try and do the longlist? I think I am, I just need to pace myself properly with ‘other books I want to read along the way’ as I didnt do this with the Orange. So how close will I get… we will have to wait and see, let me know all of your thoughts!